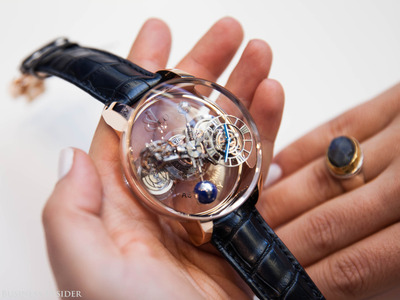 Courtney VerrillThe Astronomia Clarity watch is a mechanical wonder — and it’s worth $600,000. For the biggest, boldest bling, A-listers and billionaires have turned to one man for the last 30 years. And for the most complicated watches in the game? Still the same man. His name is Jacob Arabo, although you may have heard him referred to as “Jacob the Jeweller” in rap songs by Kanye West or 50 Cent. His clientele is a who’s-who of the international elite and Hollywood stars, from Cristiano Ronaldo to Jay Z and Beyoncé. 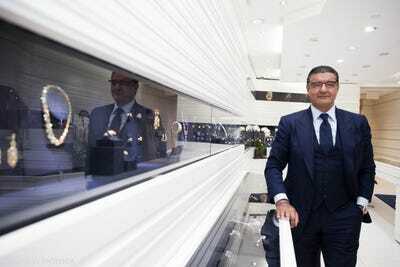 The story of his rise through the luxury jewellery industry is, like his designs, larger than life. Business Insider spent an afternoon with Arabo to learn just how this entrepreneurial Soviet émigré scaled the heights of the over-the-top jewellery and watchmaking business. It’s the story of a bold outsider becoming the ultimate insider — and it’s filled with diamonds. 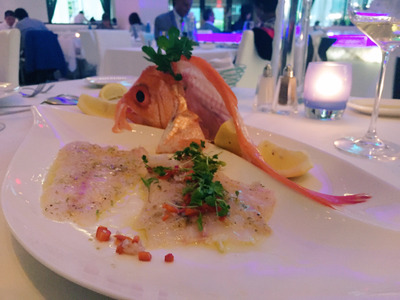 The first thing you need to know about Arabo is that he lives the luxury life of his clients. But that's been a long time in the works. Born in Uzbekistan, he emigrated with his family to New York at the age of 14, settling down in Forest Hills, Queens. With a struggling family to help support, Arabo made the decision to drop out of school at 16 and attend a jeweller's trade school in Brooklyn instead. The first piece he ever created was a brass jewellery box, which won him the class design competition. The rest, as they say, is history. He finished the course in record time, and was quickly set up at a local Jewish wholesale jewellery factory that made mass-market pieces for department stores. He lied about his age, pretending to be 18 so he could start earning a salary, which was just $125 a week. 'I was hungry to get a job,' Arabo said. But the repetitive factory experience didn't cut it for Arabo. 'I knew that I had something in me, that I could do this,' he said. He started crafting his own designs, and worked with a salesman to get them onto the market. 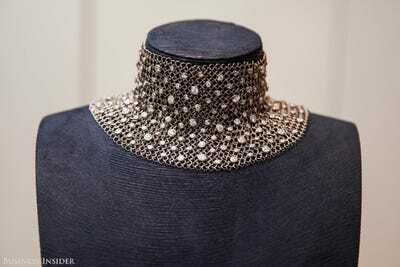 When he works on designing a piece, he typically creates a wax model of it first. Here are some recent examples of earring models, as well as a catalogue of early-stage sketches on photographs. Soon, he was making more than $1,500 a week -- more than 10 times his starting salary -- and running a makeshift workspace out of his bedroom at his family home in Queens. 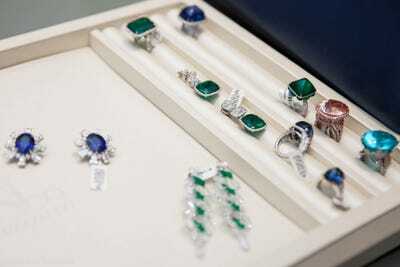 He recruited some of his peers from jewellery school to assist in the fledgling business. 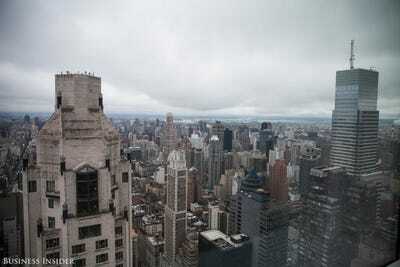 Ready to strike out on his own, he moved the business to a factory on 45th Street in Manhattan. A few years later, it was time to shift again: this time to a jewellery exchange storefront where he could finally sell his pieces under his own name. 'I really wanted to make statement pieces,' Arabo said. The other jewellers were sceptical of his flashy designs, but Arabo knew what he was doing. 'You do that, I'll do this,' he told them. He also travelled extensively to Africa and South America to source diamonds and deepen his knowledge. His reputation for unique pieces spread, and the celebrities came asking. 'Trucks would stand outside my building -- like those buses that musicians travel in -- they would stand there waiting for me to be available to see them to show them jewellery. A line of people waiting,' Arabo said. Early fans were rappers like the Notorious B.I.G. and Diddy, who peppered their lyrics with references to 'Jacob the Jeweller'. He's been mentioned in at least 70 songs. Big names in fashion, like the designers behind the Dolce & Gabbana brand, also bought in. 'And before you know, you have Michael Jackson as a client, you have David Beckham, you have Madonna, you have all these celebrities,' Arabo said. They invited him to his parties and asked him to customise pieces they would wear on magazine covers and to red carpet events. 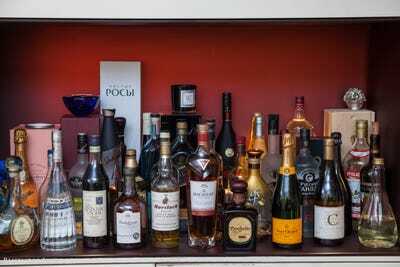 He keeps a fully stocked bar for VIP visitors, too. Arabo's father worked in the liquor industry before moving his family to the US. 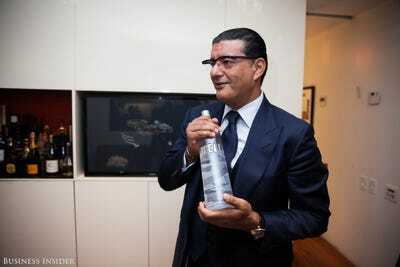 Now, Arabo has his own brand of limited-run vodka, called 'Bocaj.' His father, who's now 87, calls Arabo every morning at 6:30 a.m. to check in. Here's a selection of Jacob's watch designs, all identifiable by their signature intricacy of detail and transparent inner workings. 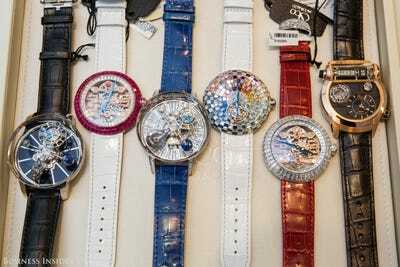 The pieces pictured here range in price from about $200,000 to about $1 million. 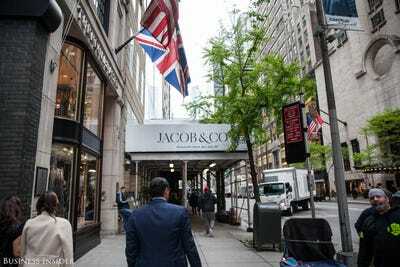 You can now buy Jacob & Co. designs in 20 countries. 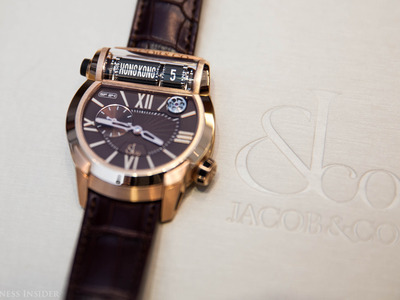 The Jacob & Co. brand is now respected by serious horological experts and Swiss watchmakers, who flock to his Baselworld booth to see what new physics-defying concoctions Arabo and his team have crafted each year. But Jacob isn't all about flashy jewels. 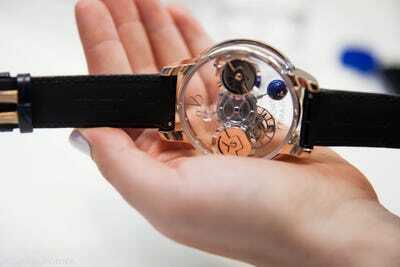 One of his signature technical achievements is this watch, the Quenttin, which starts at about $358,000. 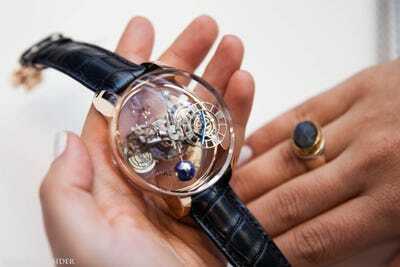 He says he was initially nervous to craft something with such a high development cost and more understated profile: it was the first watch model to have a 31-day power reserve and vertical tourbillon. As the story goes, a client walked in to the store and asked Arabo about the unusual design. 'If you give me the deposit, I will name it after you,' Arabo offered the client. He agreed to foot the bill, and the Quenttin got its name. Later, the popular film director Quentin Tarantino picked up a Quenttin of his own, and wore it on the cover of Vogue. 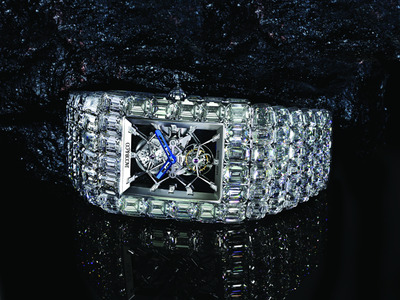 With 260 karats of diamonds, the Billionaire Watch -- worth $18 million -- was one of the most expensive watches ever created at the time Arabo debuted it in partnership with Flavio Briatore at BaselWorld in 2015. This piece, the Astronomia Clarity, is encased in sapphire and has a gravitational triple axis tourbillon with a differential gears system. It also has a perfectly spherical 288-facet 'Jacob Cut' white diamond; it retails for upwards of $600,000. When it comes to watches that push the boundaries of horology, like this one, very few brands have the resources to pursue wild concepts. Arabo works with watchmakers who will ultimately sink years of their lives into his complex projects. 'I make it so interesting for them that they want to do it,' Arabo said. He visits his workshop in Switzerland once a month. Watches like this one have a satisfying and unexpected weight to them; they're mesmerising to watch tick, like moving art. You can see the tiny globe (the blue orb on the right) and the spherical diamond rotating slowly, keeping perfect astronomical time. And then there are the diamonds. These pink and yellow gems can cost well into the millions for a single, flawless stone; the yellow diamond on the right is 75 carats. These are investment pieces along the lines of fine art or real estate, with value that will only go up over time. Some of the celebrities to wear his designs most recently include Paris Hilton and Pharrell. 'If it's not a celebrity, it's a businessman, or a princess, or a queen ... I meet all the kinds of people,' he said of his clientele. He added that his dream is to have one of his pieces grace an American president. Above, one of his more understated timepieces: the Epic SF 24, which can cycle through 24 different time zones. When Arabo set up shop on 57th Street, he had no way of knowing that it would later turn into a strip of Manhattan so wealthy, it would unofficially be called 'Billionaire's Row.' 432 Park -- one of the city's tallest residential skyscrapers, currently still under construction -- rises directly over the boutique. So it only made sense for Arabo to purchase a unit in the soaring tower, although his primary home with Angela is still in his old neighbourhood of Forest Hills. Arabo spent a reported $16.67 million for the apartment. As the day wound down, Arabo's interior designer came by to share the updated plans for the space. 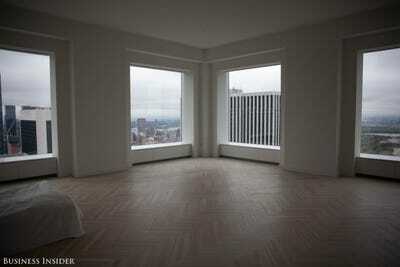 Up on the 54th floor, the 3,500-square-foot unit is all windows and pale maple floors -- for now. It's unfurnished, save for an air mattress. They recently tested the space out at night. 'It sways a little bit,' his wife, Angela, said. Arabo is as precise in his home designs as he is in his jewels. The plans include custom dark-hued cabinetry and a built-in bar. Although Arabo now seems to live a charmed life, it hasn't been without its share of challenges. In 2008, he was sentenced to 30 months in prison for lying to federal investigators during an inquiry into a money laundering case. 'It was a very challenging time in my life, but I re-emerged stronger and more focused than ever before,' Arabo said of his time in prison. After the work day was through, he hopped in his Land Rover to head to dinner. Cars are another of his passions; he owns eight, including a limited-edition Morgan, a classic London taxi with an interior 'like a Bentley', and a Ferrari 458. His latest project is also going to be auto-focused. He's designing his own brand of sportscars, to release in limited edition in the next few years. With other sportscar brands expanding into the luxury accessory space, he figured it was time for him to take his brand the other way. 'They're making jewellery -- why can't I make cars?' he said. For dinner, he headed to Limani, a sleek Greek restaurant in Rockefeller Plaza where he's a partner. Settling into a corner booth, Arabo awaited Angela's arrival while sampling fresh sashimi and warm bread dipped in olive oil. 'I love a good life. I love good wine, I love good food,' he said. Acquaintances came up to greet him during the course of the meal, as he surveyed the operation and considered making updates to the restaurant's decor. Although Arabo has three sons, he says none will be following in his footsteps. The eldest, David Arabov, is one of the founders of millennial media company Elite Daily, which he recently exited after selling for $40 to $50 million to the Daily Mail. 'You have to let them find their own way,' he said. Arabo, meanwhile, will continue to create, embody, and test the limits of luxury, just as he's been doing for the last 30 years.